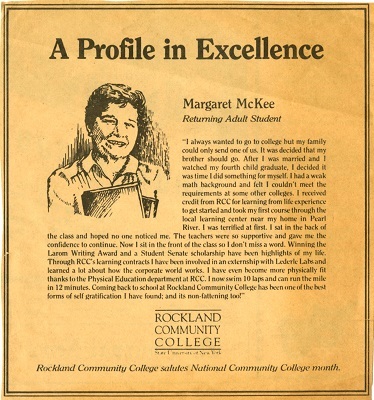 Staying engaged embodies the actions and spirit of this year’s recipient of the award for Rockland County’s Outstanding Contribution by a Senior, Margaret McKee. 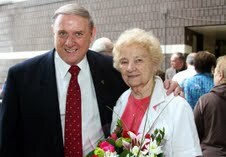 Ms. McKee received her award on May 23, 2012 when RCC hosted Senior Awareness Day, an annual event of Rockland County’s Office of the Aging. from RCC in 1986 with all As. Margaret McKee is an 87 year old senior who never misses an opportunity to advocate for her senior peers. She is constantly looking for ways to involve seniors in intellectual and stimulating activities to keep their minds active and add joy to their lives. 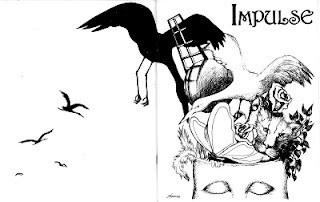 Margaret’s award winning essay appeared in the Spring 1985 edition of Impulse. Margaret was responsible for getting the Pearl River Library to allocate their community room each Monday for four hours for seniors to engage in a game and card playing. Currently approximately 32 seniors enjoy this activity. She was also responsible for having the Adult Education Department at Pearl River to offer mahjong courses, and she encouraged a group of seniors to take this mind-stimulating course. It is a new challenge they now enjoy. This contribution has helped alleviate loneliness for many seniors and keep their minds active. Margaret McKee has been an advocate for seniors as far back as the 1970s. Her mother, who lived to be 93, was her inspiration. Margaret saw her mother needed activities to keep her mentally and physically alert. 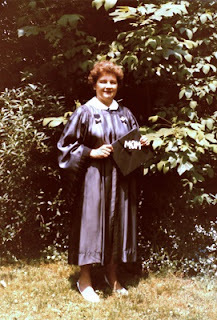 She was instrumental in having aerobics classes included in the Adult Ed Program. Ten years ago, she started a book discussion club at the Pearl River Library. It still meets today. In receiving her award, Ms. McKee said she was thrilled the honor was awarded on the stage at RCC because “RCC felt like home” and she recalled other times she was honored at RCC. Ms. McKee then told her RCC story of why the College is still a choice for her.